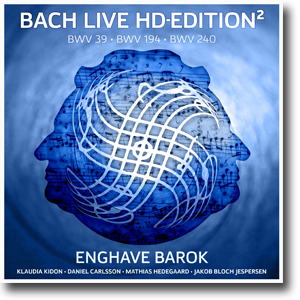 Enghave Barok’s intense performances of these cantatas, have gained worldwide acclaim from leading Bach specialists. The ensemble's burning dedication to convey the many layers hidden in Bach's music, let the listeners explore Bach's universe, with the leading Scandinavian Bach ensemble as tour guides. And this high resolution download ensures that the best place is reserved for you, the listener, right in the sweet spot in front of the Enghave Barok Ensemble. Johann Sebastian Bach's Cantatas are one of the greatest treasures in the history of music. These treasures are hidden in a wealth of maybe lesser-known works, but are never the less on pair with Bach’s more well known masterpieces. These Cantatas are full of jewels in the form of beautiful, moving and dramatic arias and choral works. The opening chorus is a small masterpiece. It is divided into three main sections, each of which relates to an adapted text from Isaiah 58, 7-8. The chorus begins, not by chance, ("Break your bread for the hungry") with chords broken down through the instrument groups. First the recorders, followed by the oboes, and at last the strings. This broken motif results in a remarkable legato sequence before the choir sets in, with the initial motive as accompaniment. Out of this motive, a fugue runs between the singing voices, while the orchestra continues the broken pattern. The voices finally meet in homophony before the opening is repeated. "Then your light will break forth like the morning roots, and your wounds will be laid quickly, your righteousness is before you, and the glory of the Lord is behind you." In the bass recitative, and the following arias this thought is continued. "To imitate his mercy, scatters here the seeds of blessing which we will reap there." Bach illustrates this by letting the alto spread the word, while the seeds, first thrown into the air before landing on the fields, are illustrated with big jumps; upward and and descending, by the oboe and the violin. The second part opens with a quote from the New Testament, Hebrews 13, 16: "Do not forget mercy and generosity; It is the kind of sacrifice God loves. " Here Bach creates the impression that this is Jesus himself who speaks. "Highest, what I have is only Your gift. If, before Your countenance, I already, with my belongings, might wish to appear thankful, nevertheless You desire no offering" sings the soprano. The alto, accompanied by the strings, sings: "I have nothing but my soul to give you. ... "
Blessed are those who, out of mercy, take on themselves the need of others, and are compassionate with the poor…..
Bach's 39th cantate is also known as "the Refugee Cantata". It had its first performance on June 23, 1726. At that time, a large group of Protestant refugees had escaped to Leipzig from Salzburg. The standard pitch has changed a lot through music history. In the 1600s Italy the standard A was tuned to ​​465Hz, while in France and England it was 392Hz. In Germany the most widely used tunings were 465Hz for Church Organs and 415Hz for chamber music and orchestral music. But in the case of Cantate 194, we are dealing with a "deviation" from the usual tuning used in Bach's Cantatas. This is because the history of Cantate 194 can be brought back to Bach's time as a court composer in Cöthen (1717-1723). The court in Cöthen fashioned French music and that explains why this Cantata was originally intended for the deeper sounding French chamber tone of 392Hz. On November 2, 1723, half a year after Bach began as cantor in Leipzig, the recent restoration of the church in the nearby town of Störmthal was to be celebrated. Bach used an older cantata from his time in Cöthen but had new words written for the occasion. In order to perform the Cantata at the pitch it was intended Enghave Barok got hold of three baroque oboes tuned at 392Hz. The violinists brought two instruments, one for the 392Hz tuning and one for the 415Hz tuning required for Cantata 39 (it is very risky to retune the instruments half a tone up on a short notice). Viola, bassoon, cello, violone and organ played instruments that were tuned in 415Hz, but using transposed charts. Further information on the pitch-subject can be found in the book A History of Performing Pitch: The Story of 'A' by Bruce Haynes. The origin of the Sanctus in G is doubtful. Carl Philipp Emmanuel Bach, attributed it to his father Johann Sebastian. However, it is highly doubtful that this work is from J.S. Bach's own hand. That Bach should have written it in Leipzig, at the height of his creative powers, seems unlikely. It may have been written when he was younger, or it could be a transcription of another composer's work. A likely candidate is Bach’s second cousin Johann Ludwig Bach. During his time in Leipzig Johann Sebastian frequently performed Johann Ludwig’s Cantatas. If the Sanctus is not composed by Bach, it does however give us an insight into Bach's knowledge of, and curiosity about, other composers' works. And it shows Bach’s practical and pragmatic approach to organizing church music in the 1730’ and 1740’. Enghave Barok, is an exciting new Scandinavian baroque ensemble consisting of the crème de la crème of Scandinavian baroque musicians. "These musicians play straight from the heart, enthusiastic, swinging and in complete agreement with the music. This is a conductor on mission with Bach’s music!. If this level can be kept on future releases I will be first in line"
-- Review by Bach expert Knud Svendsen in danish organ society magazine.